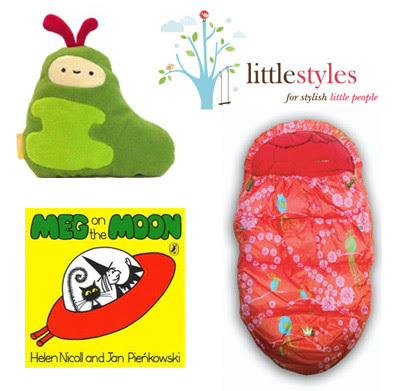 Little Styles is a gorgeous new online children's boutique and I'm so happy to welcome them as sponsors of Bondville. This store has an incredible range of children's products from Australia and around the world including much-loved labels Bebe, Big by Fiona Scanlan, Infancy, Purebaby and more. 1. Meg On The Moon by Helen Nicholls and Jan Pienkowski. I was so excited to find this book; the Meg, Mog and Owl series were favourites of mine as a child and they look gorgeous today. 2. Muddy Cloud Balob Doll from the US - hip, bright and cuddly. 3. Elodie Details Stroller Bag in Cherry blossom bird to keep baby warm and stylish on the go. And for the month of April, express post shipping is free for Little Style orders over $50. Please pop by check out the gorgeous baby gifts, clothes and products available for stylish little people. Thanks Miss Muggins! I haven't seen the series since I was little (thank goodness my Mum and Dad kept the books for me), and then at the Lifeline Bookfest this year I found a Jan Pienkowski ABC book! I just about died! Snatched it up for 50c. I'm still thrilled about it. Hi Sam - so glad to find other MM&O lovers! Will I see you on Sunday? I am seriously going to have to come over there for a visit. Such cute stuff! Hi Emily - you are welcome anytime, of course! Oooh super adorable! I love all your kid links. Great stuff! Why thank you Alex! I'm honoured that you think so. You might find something cute and Aussie for Wolfie!